BRISTOL - With a 22-7 lead at the half, the St. Paul football team was in position to pull off an upset victory over unbeaten Woodland but as the seconds ticked down in the second half, it started to look more and more unlikely. Then with three minutes remaining in the fourth quarter, Hawks’ sophomore kicker Angelo Kollcinaku drilled a crowd-silencing 22-yard field goal as the Falcons fell 23-22 on Friday night. It was a tale of two halves for the Falcons. After Woodland running back Edit Krivca ripped off a 60-yard touchdown run on the first play of the game, the rest of the first half was dominated by St. Paul. Offensively the first score of the game for the Falcons wasn’t on a run but rather a 22-yard touchdown pass from quarterback Kevin Ashworth to wide receiver John Ivers. The Falcons used the pass to open up the ground game. On its next possession, St. Paul started from its own 44-yard line after Christian Decker stuffed Krivca on a 4th and 4. Connor Bogdanski made sure to capitalize as he broke free for a 50-yard touchdown run at the 3:14 mark in the first quarter. 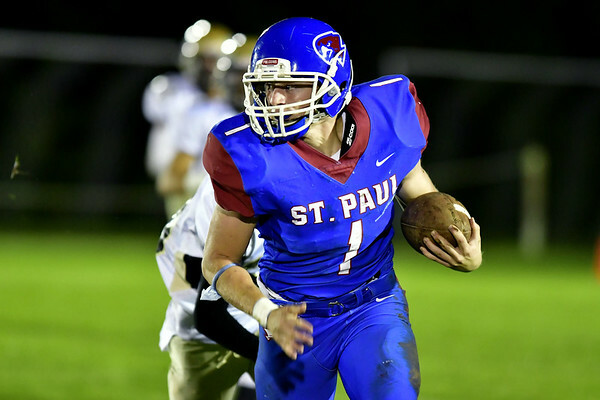 With all the momentum and a 14-7 lead, Ivers forced a fumble on the ensuing kickoff and St. Paul was back on offense in good field position from its own 49-yard line. The pass game wasn’t done yet. Ashworth found Max Peruta for a 20-yard pass to set the Falcons up in Woodland territory. Then Quentin Conner and Bogdanski rumbled to the goal line, each moving the chains and Conner finished off the drive with a 3-yard touchdown run. St. Paul was up 22-6 at the half and its defense was playing its best of the season. The Falcons struggled out of the gate offensively in the second half with a three-and out. Krivca ran in a 30-yard touchdown on Woodland’s first possession and the 16-point lead was quickly trimmed to 8. St. Paul couldn’t get anything going with another three-and-out on its next drive. Again, the Hawks capitalized, this time a 1-yard touchdown run from quarterback Tyler Bulinsky. But a personal foul penalty kept the Falcons alive down 22-20 with 10:39 remaining. St. Paul’s offensive struggles continued with another punt and then Kollcinaku’s field goal gave Woodland the lead. St. Paul had one last drive and drove down the field but could only make it to Woodland’s 30-yard line before the clock hit 0:00 and the Falcons fell to 1-4 with the loss. Rushing - St. Paul: Connor Bogdanski 14-117-1, Quentin Conner 12-50-1, Kevin Ashworth 11-24, Rudy Otero 3-5. Woodland: Edit Krivca 23-259-2, Tyler Bulinsky 3-6-1, James Champagne 1-32, Jason Palmieri 2-7, Nick Rousseau 4-12. Passing - St. Paul: Ashworth 3-7-66-1. Woodland: Bulinsky 5-10-49-0. Receiving - St. Paul: John Ivers 1-22-1, Max Peruta 3-44. Woodland: Nick Rousseau 1-5, Krivca 3-37, Justin Marks 1-7. Posted in The Bristol Press, St. Paul on Friday, 5 October 2018 23:13. Updated: Friday, 5 October 2018 23:15.